Adviser to the Prime Minister on Commerce, Textile, and Industry Abdul Razak Dawood said on 28 January 2019 that though Pakistan is helping America in restoring peace in Afghanistan, a free trade agreement (FTA) with the US is very difficult. Talking about the issue of security clearance and giving visa on arrival facility to 60 countries, Mr Dawood said the government first wants to see what will happen once we open Pakistan to more and more countries. “Through this decision, we will come to know the visits of foreigners from these countries and their interests in investing in Pakistan. It will also be helpful in promoting our tourism sector,” he said. The regime is fixated on the IMF prescription of maintaining dollar reserves, through exports, foreign direct investment and tourism. However, this will not lead to Pakistan’s economic revival and will maintain its dependence on the West. Exports bring dollars but give a production focus to meet the needs of Western economies, rather than Pakistan’s critical needs. This is a dangerous focus because the country’s industry will become heavily dependent on the ups and downs of international markets, rather than stable domestic demand. In pursuit of this policy the government seems to be content with the foreign exchange it receives through exports by the food industry, leather industry and sports equipment manufacture, whereas the absence of heavy machinery and aircraft engine-manufacturing means that Pakistan is at the mercy of foreign powers to fulfill its defense requirements and domestic demand for heavy machinery. Without doubt, this policy of the government is the cause of economic backwardness rather than economic progress. As for Foreign Direct Investment, it also brings in dollars initially, but increases foreign dominance of essential local industry, squeezes out local manufacturers and leads to capital leaving the country in the form of repatriation of profits back to the foreign countries. Tourism brings in dollars as well but leads to capital being diverted from the essential work of building the backbone of a strong economy, a heavy industrial base. The farmers’ community is dissatisfied with the measures announced in the second mini-budget of the fiscal year as it believes that the mini-budget will not benefit small landholders, reported Dawn Newspaper on 28 January 2019. Kissan Rabita Committee Pakistan General Secretary Farooq Tariq said, “The tax incentive for banks won’t improve the farmers’ access to finance. Loans for agriculture production and agriculture processing units have been brought under one head… In the name of agriculture, loans are now being offered to feed mills, hatcheries and other processing units.” The president of Kissan Ittehad Mr. Khokhar quoting a document of the Punjab government said that the cost of production for basmati rice in Pakistan is 34pc higher than India while it is 37pc, 57pc, 44pc and 34pc higher in the cases of wheat, cotton, onion and gram. The economic situation of farmers is deteriorating day by day, as each successive regimes implement capitalism. Farmers’ limited access to inputs, their poor financial and technical resources, inefficient irrigation, where 0.93 million hectares are rain-fed, as well as a marked decline in land use, all hamper Pakistan’s agricultural potential. This is in addition to a weak seed industry, poor research and development, supply-driven instead of demand-oriented production and a lack of appropriate storage facilities. Out of 2.86 million hectares of cultivable land, 1.16 million hectares remains unutilized in KPK province alone. As a whole, Pakistan’s existing land is underutilized. The total area of farm land of Pakistan is about 30 million hectors, out of which 22 million hectares is being cultivated. The rest amounts to the cultivable waste. 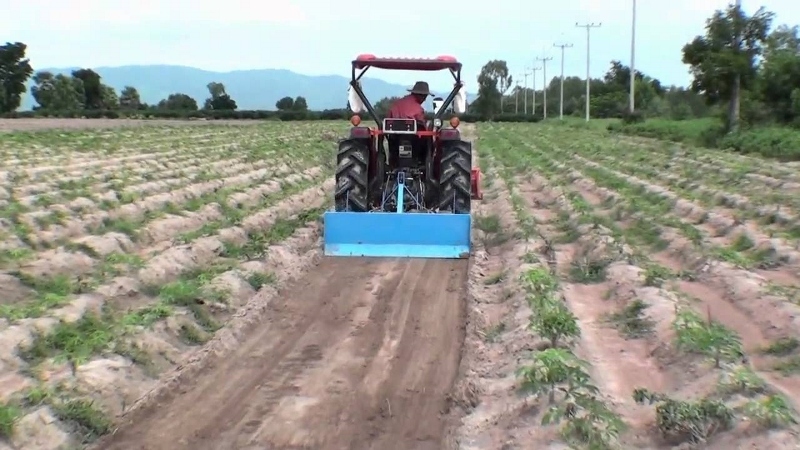 Out of the cultivated land, about 6 million hectors of ploughed area remains un-cropped annually. Only 7 million hectares area is sown more than once a year. Capitalism has focused benefits upon a small agricultural elite, but left the masses of smaller land holders and landless labor to suffer. So, all too often those who practically cultivate are denied the right to own land. If they attempt to, they take on the burden of interest based loans, adding to their problems. By implementing Islam’s economic system, the Khilafah will boost agricultural production and rural employment, whilst strengthening Pakistan’s food security. Uniquely, Islam strongly links the issue of ownership of the land with its cultivation. So regardless of whether the land-owner has large tracts of lands, or small tracts of it, he must supervise its cultivation personally. Moreover, the state will assist the owners in cultivation, whether through grants or through interest-free loans. If the owner of land is unwilling or unable to cultivate his agricultural land, despite assistance being offered, he is not allowed to hire it to another to cultivate it. RasulAllah ﷺ said, «ازْرَعْهَا أَوْ امْنَحْهَا أَخَاكَ» “Cultivate it or give it to your brother.” And Islam encourages the revival of uncultivated agricultural land by granting ownership to the one who revives dead [barren] land to agricultural productivity. RasulAllah ﷺ said, «مَنْ أَحْيَا أَرْضًا مَيِّتَةً فَهِيَ لَهُ» “Whoever revives a dead land, it belongs to him.” [Tirmidhi]. In addition, the Khilafah will establish extensive irrigation systems to lands near and far from water sources. It will open nurseries and laboratories for the development of stronger seed lines and better fertilizer, as well as improved disease prevention and resistance. Prime Minister Imran Khan said on 27 January 2019, that his government was laying the foundation of a true democratic system in the country in which every ruler would be held accountable and they would have no opportunity to fritter away public money. His speech was delivered as rumors become rife of a change from parliamentary democracy to presidential democracy. Such rumors are a cover for moving democracy from the control of corrupt political leaderships to corrupt military leaderships, as has already been seen in the “true democracy” of President General Musharraf, whose very name now evokes anger. Imran Khan came to power on promises of a Madinah state, in a country which was created in the name of Islam, but now talks of founding true democracy, a man-made system of disbelief. Democracy and the Madinah State come from contradictory beliefs. Democracy stems from secularism which declares that divine law has no place in determining societal laws and must be confined to individual practice. However, the Islamic state of Madinah was established on the belief that the laws of Allah (swt) alone govern both the society and the individual. Allah (swt) said, وَمَا كَانَ لِمُؤۡمِنٍ وَّلَا مُؤۡمِنَةٍ اِذَا قَضَى اللّٰهُ وَرَسُوۡلُهٗۤ اَمۡرًا اَنۡ يَّكُوۡنَ لَهُمُ الۡخِيَرَةُ مِنۡ اَمۡرِهِمۡ ؕ وَمَنۡ يَّعۡصِ اللّٰهَ وَرَسُوۡلَهٗ فَقَدۡ ضَلَّ ضَلٰلًا مُّبِيۡنًا “It does is not befitting for a believer, male or female, that when Allah and His Messenger have decided an affair, they should exercise their choice. And whoever disobeys Allah and His Messenger has strayed to manifest error.” [Surah Al-Ahzab 33:36].